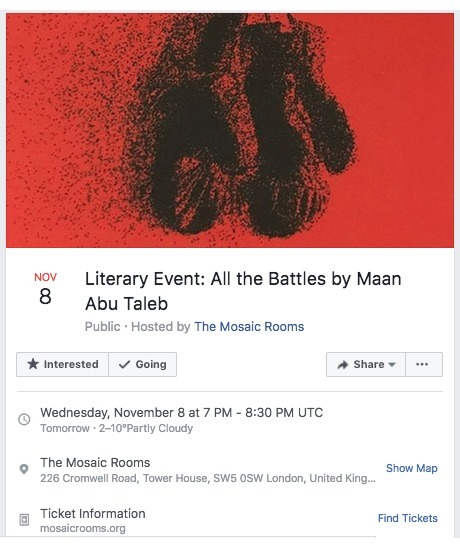 Maan Abu Taleb, author of the recently published Hoopoe novel, All the Battles, will be speaking at The Mosaic Rooms in London on November 8 at 7:00pm. All the Battles, translated by Robin Moger, who is also attending the event and will be discussing the novel with the author, has been described as “the sort [of novel] that grabs the reader by the collar, letting go only after its finish. . . a work of high-energy artistic expression” by Hisham Bustani, author of The Perception of Meaning. 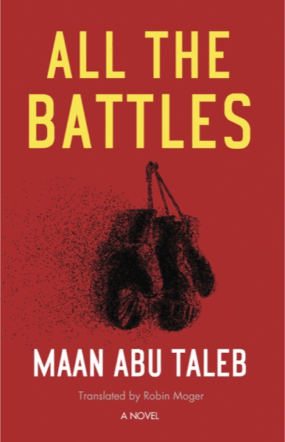 All the Battles, Abu Taleb’s debut novel, centers around Said who leads a comfortable, yet boring, middle-class life. That is, until one afternoon, he leaves work early and crosses into the rough side of town, in search of a run-down boxing club. His obsession with this underground sport grows: he starts skipping work and showing up with visible injuries. Things begin to unravel as he quits his job, trains full time, and is entered for the fight of his life. But at what cost? Beautifully observed and carefully paced, and far from being a celebration of machismo, All the Battles is a compelling story of class, identity, and personal transformation. 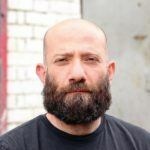 Abu Taleb is the founding editor of Ma3azef, the Arab world’s leading online music magazine, and he holds a master’s degree in philosophy and contemporary critical theory. Born and raised in Amman, Jordan, he now lives in London, UK.